If you know me, you know I love this Project! I have no affiliation with PL, I just love it :) Read my other Project Life Posts HERE and HERE. I am working on my 2011 and 2012 at the exact same time which is crazy and not recommended ha! I keep forgetting what year and writing the wrong dates! Especially with the boys being only 18 mos apart I’m like what kid is that… and what year?? Here is a little update from the craft room. I am up to date on both years through May… woo hoo! For 2011 I have the Amber Core Kit and for 2012 I have the Cobalt Core Kit.I am trying to use different materials like sequins and buttons. I have a love for sequins. 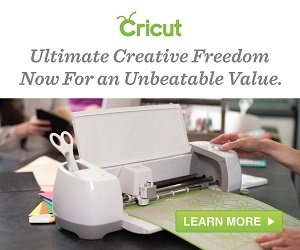 Another new thing I love, I just staple embelishments right onto the photo which is kind of liberating for some reason. 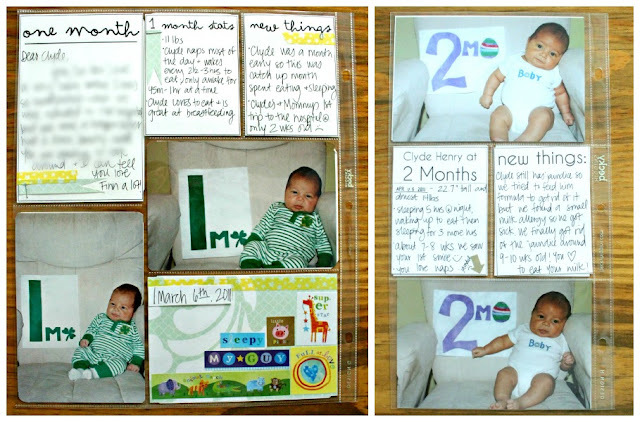 I used quite a few staples on this page… also please don’t judge these one month old Clyde pics, yes he is almost 2. Better late than never? As I work more on my book I get more creative with other textures. It looks so much more interesting to break up the solid picture pages. I am in love with this Monthly Calendar stamp. HERE is a similar one. I use it all the time! I have been using these 6×12 page protectors for cards. 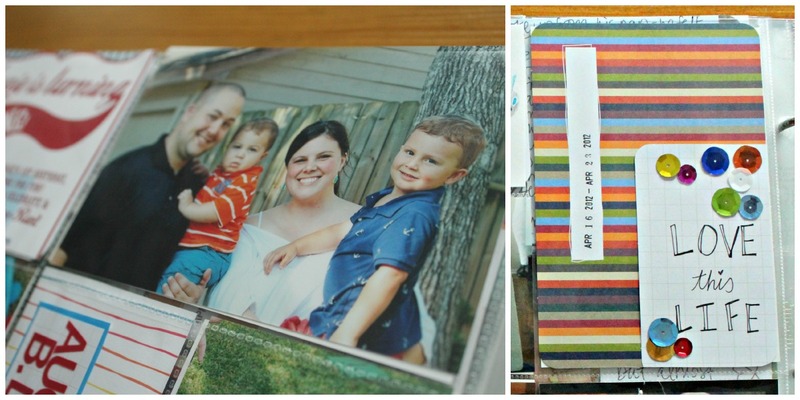 A lot of people use Project Life as a “week in the life project” or a “photo a day” but that’s not really my style. Sometimes, like with Clyde’s Bday above I have 50 pictures from one day. Then some months we don’t have a lot going on so a whole month will fit on 1 page. Here, I made a whole page just about ampersand. These pics range from about 3 months but I thought they would look better together. And here is a whole month on a page. I love using these pages Design G and Design H for the Monthly Updates. I want them to be on their own page but I don’t need 4 or 5 of the same picture so these smaller pages work great for me. And two of my favorite title pages…. I used a real band-aid for a page all about first Clyde’s ER Trip. I thought I was being so original but then I saw some band-aid stickers last week that looked just like it. So does anyone out there do project life? If you have pictures PRETTY PLEASE link them up in the comments, I would love to see some new ideas. Love this project. I make a scrapbook for my Grandson after every birthday party and he thinks it is so neat. I always tell everyone…take lots of photos, because you can’t go back and do it. Your boys certainly make beautiful photos! What a gorgeous book! I tried scrap booking but it looked NOTHING like yours! Love your pages! They are so fun to look at! That calendar stamp is FANTASTIC. I’m going to have to get one. 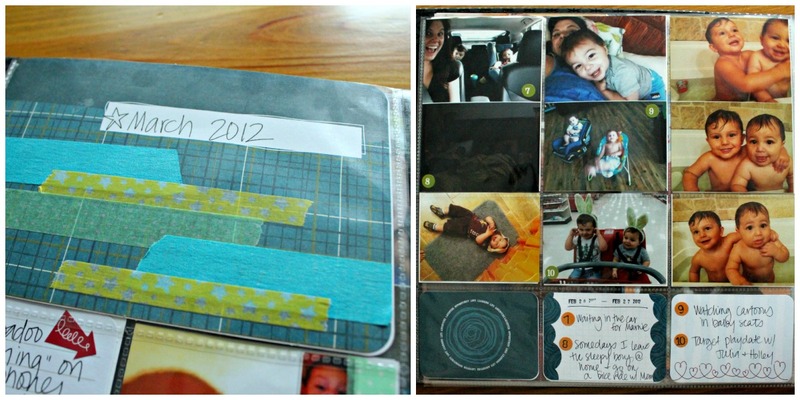 I JUST started doing Project Life…was thinking about doing 2011 too, but I’m not sure I can handle doing both years at once. Bravo to you! I scrapbook but I don’t do Project Life. I started to do a full year in January but, somewhere along the line I got distracted. I find this new way of scraping very liberating to the old way I used to do it. Your book is gorgeous and what an undertaking…. Love your PL! I love how you don’t always do it week by week. Sometimes I have a lot of trouble filling weeks. I love the calendar stamp! Must get one of those. I don’t have a lot of my PL posted yet, but would be excited if you looked at what I have! Congrats on the store opening.